I am TIRED and it is WORTH it! As we finish up yet another school year I want to applaud all of you teachers for using your super power to help children young and old find their passion and potential. 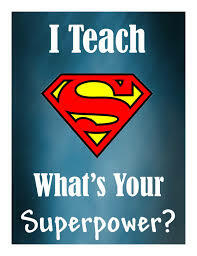 Your super power is stopping bullying, waiting to go to the bathroom for hours, disciplining, loving every child, being compassionate, feeding the hungry, and so many other parts of the teaching profession that we GET to do each and every day. You are a super hero! You could have been so many things, but you didn’t. You CHOSE to become a TEACHER! I saw this video on Facebook. Take the time to watch the video all the way through. Dear teachers,Thank you. Enjoy your Winter Break. I am TIRED, and it is WORTH IT!